When Dorothy's house landed on the Wicked Witch of the East, I don't imagine she had any idea of the battle between herself and the Wicked Witch of the East that would begin over a simple pair of Ruby Red Slippers. And I don't imagine that she had any idea, that it would continue on into our Wizard of Oz party and beyond. 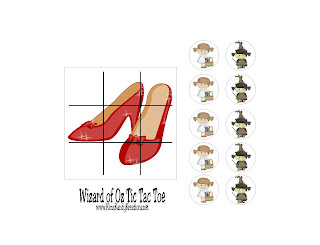 When thinking of fun party favors to give our guests, I decided to try and make a game where the fight for the red slippers would continue. 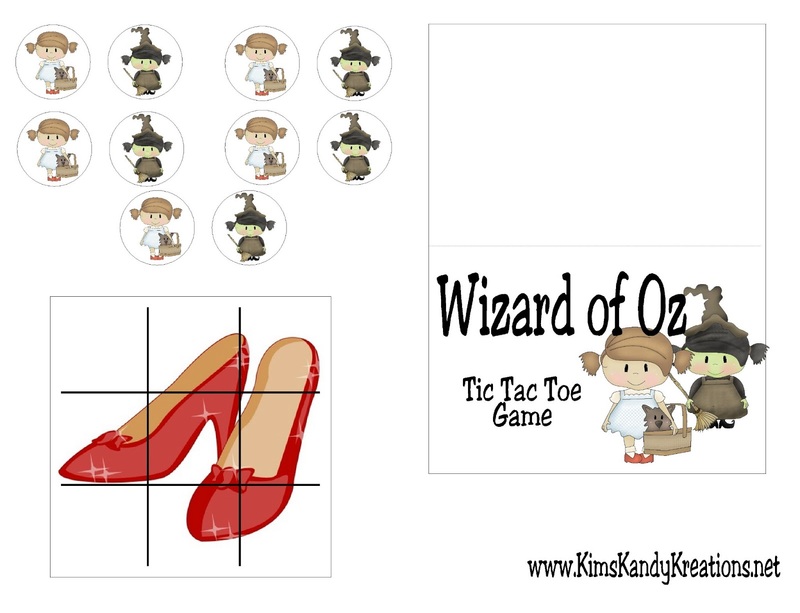 So this Wizard of Oz Tic Tac Toe game was born. And it's a simple and cheap party favor idea which makes the battle all the more enjoyable. 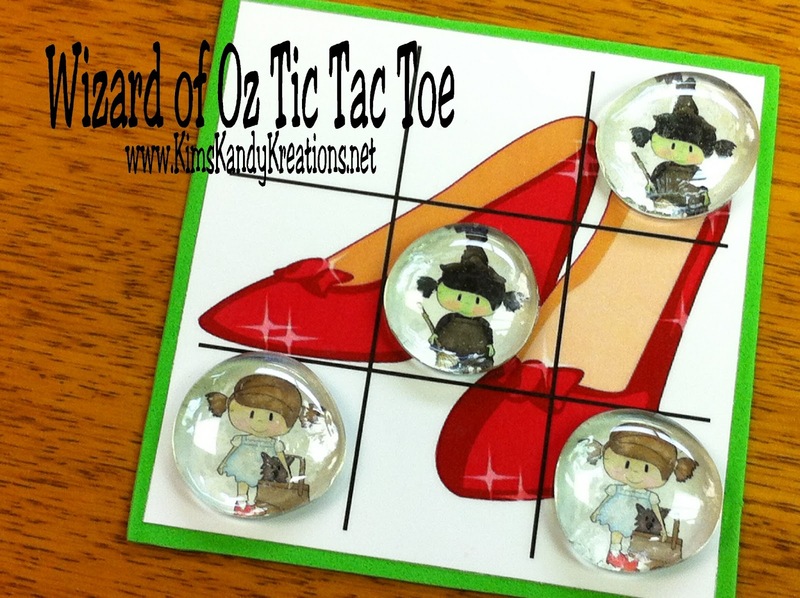 Originally I had planned to make these tic tac toe boards from a 4x4 ceramic tile, but I began to debate on the wisdom of giving kids breakable ceramic tile as party favors. So when I found these foam sheets at Dollar Tree, I decided to go with them instead. Plus, 32 sheets for a dollar is more than great for my budget. I also picked up a bag of Accent Gems for the game pieces at Dollar Tree. I printed out my game pieces onto card stock. The foam sheets are pretty thin, so I thought that the strength of card stock would help with the durability of the game. The game board is 3 3/4 inches square and each of the Dorothy and Witch pieces are 1 inches, so that was easy to cut with a circle hole punch. I absolutely LOVE my Xyron sticker machine and have several different sizes. I used the Xyron 510 and the Laminate/Permanent Sticker cartridge to make the pieces into stickers. I ran the game board through right side up, but rotated all the circle pieces so that they would shine through the gem accents when placed on each of the accent gems. The foam pieces were 4x6 inches, so I cut them into a 4x4 square. I finished the game by placing the game board sticker on the front. Then I realized that I needed a way to send these home with the kids, so I bagged them into 4x6 inch bags and added a bag topper. Good luck! May the shoes be ever in your favor...oh wait (wrong movie)..may the shoes be with you...(nope...that's Star Wars...) oh well...Live Long and Prosper. So darn cute and creative. Did you laminate or how did you attach the card stock to the foam?